A scary event for the band as we sit in the centre of the track whilst the donkeys hurtle around us at top speed. With stalls, competitions, a dog show and donkeys this is a great May day out for the family. Times to be confirmed. Please check with the organiser for changes. A private event for the children and parents of Canford School. Fast and exciting races, tea and cake by the river, to the accompaniment of brass band entertainment. 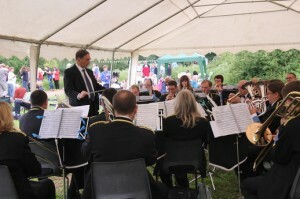 A regular annual engagement for Poole Borough Band. Imagine a summers evening with good food and drink accompanied by the unique sound of your local brass band. Join us! Times to be confirmed. Please check with the organiser for changes.